Everyone loves chocolate, right? It’s among the more ubiquitous gifts, one that anyone can appreciate. But if you want to go the extra mile with getting chocolate for your Significant Other, this personalised “I Love You More Than” Milk Chocolate Bar is just the way to do it. 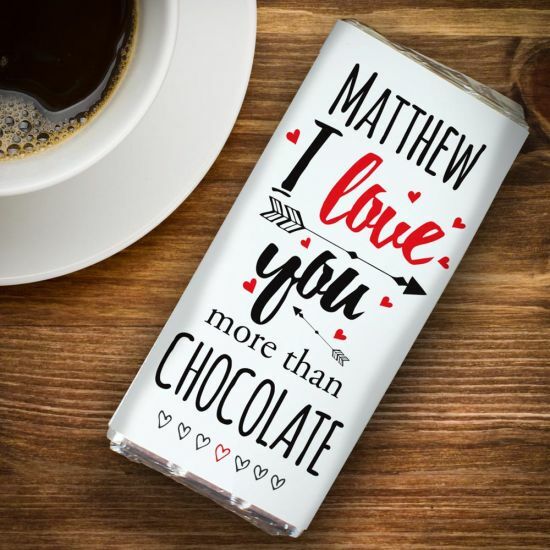 With space on the front for a name of up to 12 characters and an object you love that person more than of up to 12 characters (for example, “Matthew, I love you more than wine”), this chocolate bar is the perfect way to show someone you care. There is even space for a personal message on the back of the bar (2 lines of text, both with a 25 character limit) - we'd suggest "Remember" and "it's good to share". At 15 centimetres long and 7 centimetres wide, it’s a good size bar that will easily satisfy all but the most ardent chocolate enthusiasts.